you may want to cover her ears. 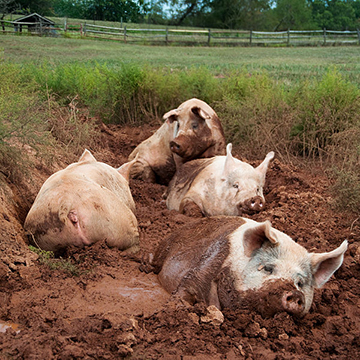 the mud wallows of America won’t seem so satisfying anymore. 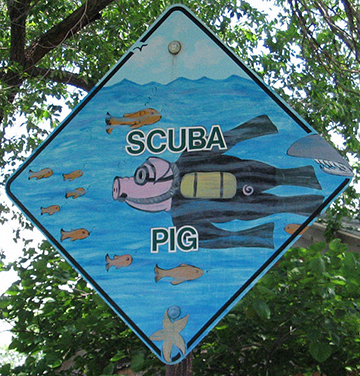 Yup, the island is populated by pigs. 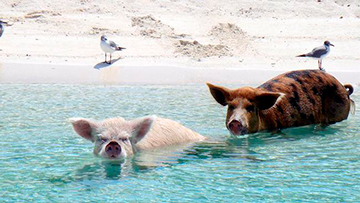 While no one knows exactly how these pigs laid claim to their own private piece of hog heaven, legend has it that sailors left them on the uninhabited island as food security for future stopovers. Perhaps they were forgotten or too clever to be caught? 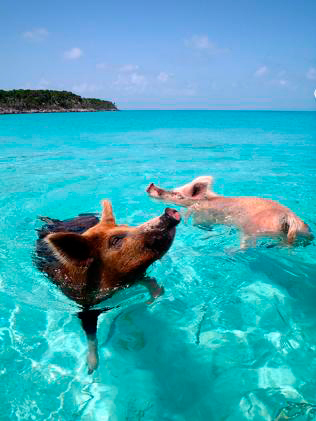 Either way, there are now about 20 pigs on Big Major Cay, living high on the hog. 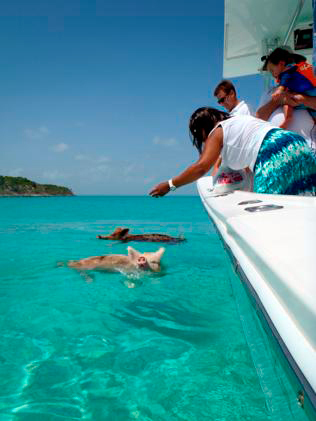 The pigs were discovered in 2007 by boat captain Jim Abernathy and his passenger, photographer Eric Cheng. Sure enough, there were pigs a-plenty. and they are pleased as punch to plunge into the sea. 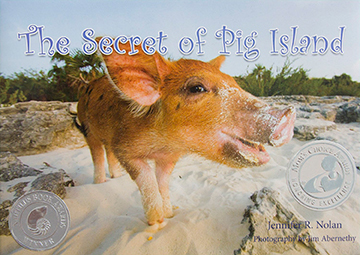 In 2010, Captain Jim Abernethy collaborated with author Jennifer Nolan to publish a children’s book about the pigs called The Secret of Pig Island. 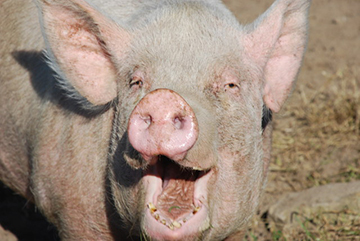 This is amazing about pigs! I would have never guessed they would take to the ocean so favorably. 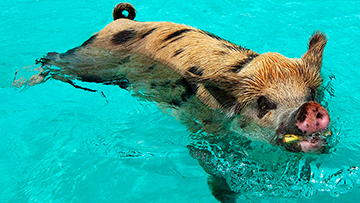 But that water is so beautiful and calm, it is easy to understand the ease of enjoying a swim and the occasional treat! My whole family was amazed at this video and story. 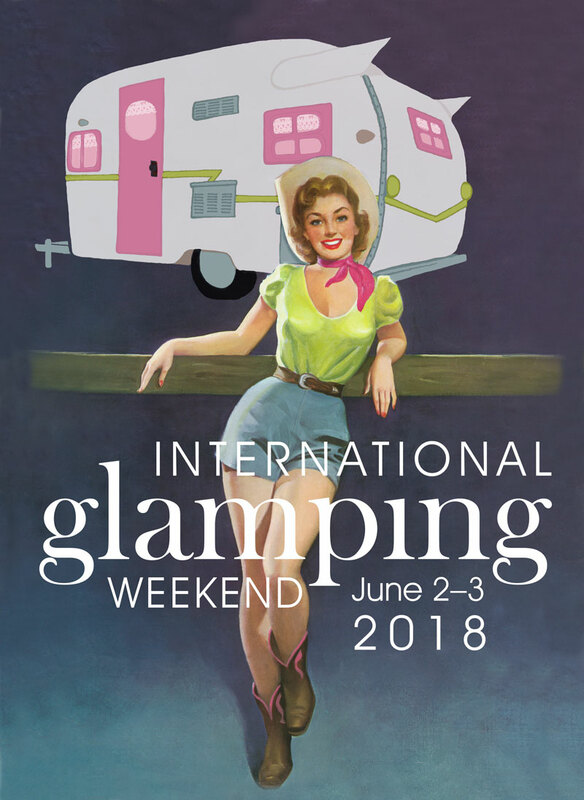 Thank you for sharing the story with us!